Vitamin B12, also called cobalamin, is a water-soluble vitamin that has a key role in the normal functioning of the brain and nervous system, and the formation of red blood cells. It is one of eight B vitamins. It is involved in the metabolism of every cell of the human body, especially affecting DNA synthesis, fatty acid and amino acid metabolism. No fungi, plants, nor animals (including humans) are capable of producing vitamin B12. Only bacteria and archaea have the enzymes needed for its synthesis. Proven sources of B12 are animal products (meat, fish, dairy products) and supplements. Some research states that certain non-animal products possibly can be a natural source of B12 because of bacterial symbiosis. B12 is the largest and most structurally complicated vitamin and can be produced industrially only through a bacterial fermentation-synthesis. This synthetic B12 is used to fortify foods and sold as a dietary supplement. Vitamin B12 was discovered as a result of its relationship to the disease pernicious anemia, an autoimmune disease in which parietal cells of the stomach responsible for secreting intrinsic factor are destroyed; these cells are also responsible for secreting acid in the stomach. Because intrinsic factor is crucial for the normal absorption of B12, its lack in the presence of pernicious anemia causes a vitamin B12 deficiency. Many other subtler kinds of vitamin B12 deficiency and their biochemical effects have since been elucidated. Due to impairment of vitamin B12 absorption during aging, people over age 60 are at risk of deficiency. The Food and Nutrition Board of the U.S. Institute of Medicine (IOM) updated Estimated Average Requirements (EARs) and Recommended Dietary Allowances (RDAs) for vitamin B12 in 1998. The current EAR for vitamin B12 for women and men ages 14 and up is 2.0 μg/day; the RDA is 2.4 μg/day. RDAs are higher than EARs so as to identify amounts that will cover people with higher than average requirements. RDA for pregnancy equals 2.6 μg/day. RDA for lactation equals 2.8 μg/day. For infants up to 12 months the Adequate Intake (AI) is 0.4-0.5 μg/day. and for children ages 1–13 years the RDA increases with age from 0.9 to 1.8 μg/day. Because 10 to 30 percent of older people may be unable to effectively absorb vitamin B12 naturally occurring in foods, it is advisable for those older than 50 years to meet their RDA mainly by consuming foods fortified with vitamin B12 or a supplement containing vitamin B12. Collectively the EARs, RDAs and ULs are referred to as Dietary Reference Intakes. As for safety, the IOM sets Tolerable Upper Intake Levels (known as ULs) for vitamins and minerals when evidence is sufficient. In the case of vitamin B12there is no UL, as there is no human data for adverse effects from high doses. The European Food Safety Authority reviewed the same safety question and also reached the conclusion that there was not sufficient evidence to set a UL for vitamin B12. For U.S. food and dietary supplement labeling purposes the amount in a serving is expressed as a percent of Daily Value (%DV). For vitamin B12 labeling purposes 100% of the Daily Value was 6.0 μg, but as of May 2016 has been revised downward to 2.4 μg. A table of the pre-change adult Daily Values is provided at Reference Daily Intake. Food and supplement companies have until July 2018 to comply with the change. Vitamin B12 deficiency can potentially cause severe and irreversible damage, especially to the brain and nervous system. At levels only slightly lower than normal, a range of symptoms such as fatigue, lethargy, depression, poor memory, breathlessness, headaches, and pale skin, among others, may be experienced, especially in elderly people (over age 60) who produce less stomach acid as they age, thereby increasing their probability of B12deficiencies. Vitamin B12 deficiency can also cause symptoms of mania and psychosis. Vitamin B12 deficiency is most commonly caused by low intakes, but can also result from malabsorption, certain intestinal disorders, low presence of binding proteins, and use of certain medications. Vitamin B12 is rare from plant sources, so vegetarians are most likely to suffer from vitamin B12 deficiency. Infants are at a higher risk of vitamin B12 deficiency if they were born to vegetarian mothers. The elderly who have diets with limited meat or animal products are vulnerable populations as well. Vitamin B12 deficiency may occur in between 40% to 80% of the vegetarian population. In Hong Kong and India, vitamin B12 deficiency has been found in roughly 80% of the vegan population as well. Vitamin B12 is used to treat vitamin B12 deficiency, cyanide poisoning, and hereditary deficiency of transcobalamin II. It is given as part of the Schilling test for detecting pernicious anemia. For cyanide poisoning, a large amount of hydroxocobalamin may be given intravenously and sometimes in combination with sodium thiosulfate. The mechanism of action is straightforward: the hydroxycobalamin hydroxide ligand is displaced by the toxic cyanide ion, and the resulting harmless B12complex is excreted in urine. 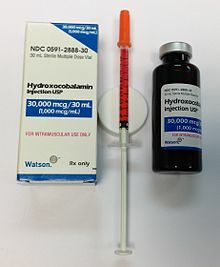 In the United States, the Food and Drug Administration approved (in 2006) the use of hydroxocobalamin for acute treatment of cyanide poisoning. Foods having rich content of vitamin B12 include clams, organ meats (especially liver) from lamb, veal, beef, and turkey, fish eggs, mackerel, and crab meat. B12 is produced in nature only by prokaryotes in the form of certain bacteria and archaea; it is not made by any multicellular or single-celled eukaryotes. It is synthesized by some gut bacteria in humans and other animals, but humans cannot absorb the B12 made in their guts, as it is made in the colon which is too far from the small intestine, where absorption of B12 occurs. Ruminants, such as cows and sheep, absorb B12 produced by bacteria in their guts. For gut bacteria of ruminants to produce B12 the animal must consume sufficient amounts of cobalt. Grazing animals pick up B12 and bacteria that produce it from the soil at the roots of the plants they eat. Animals store vitamin B12 in liver and muscle and some pass the vitamin into their eggs and milk; meat, liver, eggs and milk are therefore sources of the vitamin for other animals, including people.For humans, the bioavailability from eggs is less than 9%, compared to 40% to 60% from fish, fowl and meat. Insects are a source of B12 for animals (including other insects and humans). Feces is a rich source of vitamin B12 and many species, including rabbits, dogs, and cats eat feces. Foods fortified with B12 are also dietary sources of the vitamin. Foods for which B12-fortified versions are widely available include breakfast cereals, soy products, energy bars, and nutritional yeast. The UK Vegan Society, the Vegetarian Resource Group, and the Physicians Committee for Responsible Medicine, among others, recommend that every vegan who is not consuming adequate B12 from fortified foods take supplements. Hydroxocobalamin injection USP (1000 µg/mL) is a transparent red liquid solution of hydroxocobalamin which is available in a 30 mL brown glass multidose vial packaged in a paper box. Shown is 500 µg B12 (as 1/2 cc) drawn up in a 1/2 cc U-100 27 gauge x 1/2" insulin syringe, as prepared for subcutaneous injection. Recently sublingual methylcobalamin has become available in 5 mg tablets. The metabolic fate and biological distribution of methylcobalamin are expected to be similar to that of other sources of vitamin B12 in the diet. No cyanide is released with methylcobalamin, and the amount of cyanide (20 µg) in a 1,000 µg cyanocobalamin tablet is less than daily consumption from food. Safety of all forms of the vitamin is well established. Pseudovitamin-B12 refers to B12-like analogues that are biologically inactive in humans and yet found to be present alongside B12 in humans, many food sources (including animals), and possibly supplements and fortified foods. Most cyanobacteria, including Spirulina, and some algae, such as dried Asakusa-nori (Porphyra tenera), pseudovitamin-B12 have been found to contain mostly pseudovitamin-B12 instead of biologically active B12. H2-receptor antagonists: include cimetidine (Tagamet), famotidine (Pepcid), nizatidine (Axid), and ranitidine (Zantac). Reduced secretion of gastric acid and pepsin produced by H2 blockers can reduce absorption of protein-bound (dietary) vitamin B12, but not of supplemental vitamin B12. Gastric acid is needed to release vitamin B12 from protein for absorption. Clinically significant vitamin B12 deficiency and megaloblastic anemia are unlikely, unless H2 blocker therapy is prolonged (2 years or more), or the person's diet is poor. It is also more likely if the person is rendered achlorhydric(with complete absence of gastric acid secretion), which occurs more frequently with proton pump inhibitors than H2 blockers. Vitamin B12 levels should be monitored in people taking high doses of H2 blockers for prolonged periods. Proton pump inhibitors (PPIs): The PPIs include omeprazole (Prilosec, Losec), lansoprazole (Prevacid), rabeprazole (Aciphex), pantoprazole (Protonix, Pantoloc), and esomeprazole (Nexium). The reduced secretion of gastric acid and pepsin produced by PPIs can reduce absorption of protein-bound (dietary) vitamin B12, but not supplemental vitamin B12. Gastric acid is needed to release vitamin B12 from protein for absorption. Reduced vitamin B12 levels may be more common with PPIs than with H2-blockers, because they are more likely to produce achlorhydria (complete absence of gastric acid secretion). Clinically significant vitamin B12 deficiency is unlikely, unless PPI therapy is prolonged (2 years or more) or dietary vitamin intake is low. Vitamin B12 levels should be monitored in people taking high doses of PPIs for prolonged periods. Metabolism of folic acid. The role of Vitamin B12is seen at bottom-left. Methyl (-CH3) group transfers between two molecules. These use MeB12 (methylcobalamin) form of the vitamin. MUT is an isomerase which uses the AdoB12 form and reaction type 1 to catalyze a carbon skeleton rearrangement (the X group is -COSCoA). MUT's reaction converts MMl-CoA to Su-CoA, an important step in the extraction of energy from proteins and fats (for more see MUT's reaction mechanism). This functionality is lost in vitamin B12 deficiency, and can be measured clinically as an increased methylmalonic acid (MMA) level. Unfortunately, an elevated MMA, though sensitive to B12 deficiency, is probably overly sensitive, and not all who have it actually have B12 deficiency. For example, MMA is elevated in 90–98% of patients with B12 deficiency; 20–25% of patients over the age of 70 have elevated levels of MMA, yet 25–33% of them do not have B12 deficiency. For this reason, assessment of MMA levels is not routinely recommended in the elderly. There is no "gold standard" test for B12 deficiency because as a B12 deficiency occurs, serum values may be maintained while tissue B12 stores become depleted. Therefore, serum B12 values above the cut-off point of deficiency do not necessarily indicate adequate B12 status. The MUT function is necessary for proper myelin synthesis (see mechanism below) and is not affected by folate supplementation. Vitamin B12-dependent MTR reactions may also have neurological effects, through an indirect mechanism. Adequate methionine (which, like folate, must otherwise be obtained in the diet, if it is not regenerated from homocysteine by a B12 dependent reaction) is needed to make S-adenosyl-methionine (SAMe), which is in turn necessary for methylation of myelin sheath phospholipids. Although production of SAMe is not B12 dependent, help in recycling for provision of one adequate substrate for it (the essential amino acid methionine) is assisted by B12. In addition, SAMe is involved in the manufacture of certain neurotransmitters, catecholamines and in brain metabolism. These neurotransmitters are important for maintaining mood, possibly explaining why depression is associated with B12deficiency. Methylation of the myelin sheath phospholipids may also depend on adequate folate, which in turn is dependent on MTR recycling, unless ingested in relatively high amounts. Methyl-B12 is absorbed by two processes. The first is an intestinal mechanism using intrinsic factor through which 1-2 micrograms can be absorbed every few hours. The second is a diffusion process by which approximately 1% of the remainder is absorbed. The human physiology of vitamin B12 is complex, and therefore is prone to mishaps leading to vitamin B12 deficiency. Protein-bound vitamin B12must be released from the proteins by the action of digestive proteases in both the stomach and small intestine. Gastric acid releases the vitamin from food particles; therefore antacid and acid-blocking medications (especially proton-pump inhibitors) may inhibit absorption of B12. The total amount of vitamin B12 stored in body is about 2–5 mg in adults. Around 50% of this is stored in the liver. Approximately 0.1% of this is lost per day by secretions into the gut, as not all these secretions are reabsorbed. Bile is the main form of B12 excretion; most of the B12 secreted in the bile is recycled via enterohepatic circulation. Excess B12 beyond the blood's binding capacity is typically excreted in urine. Owing to the extremely efficient enterohepatic circulation of B12, the liver can store 3 to 5 years’ worth of vitamin B12; therefore, nutritional deficiency of this vitamin is rare. How fast B12levels change depends on the balance between how much B12 is obtained from the diet, how much is secreted and how much is absorbed. B12 deficiency may arise in a year if initial stores are low and genetic factors unfavourable, or may not appear for decades. In infants, B12 deficiency can appear much more quickly. B12 is the most chemically complex of all the vitamins. The structure of B12 is based on a corrin ring, which is similar to the porphyrin ring found in heme, chlorophyll, and cytochrome. The central metal ion is cobalt. Four of the six coordination sites are provided by the corrin ring, and a fifth by a dimethylbenzimidazole group. The sixth coordination site, the center of reactivity, is variable, being a cyano group (-CN), a hydroxyl group (-OH), a methyl group (-CH3) or a 5'-deoxyadenosyl group (here the C5' atom of the deoxyribose forms the covalent bond with Co), respectively, to yield the four B12 forms mentioned below. Historically, the covalent C-Co bond is one of the first examples of carbon-metal bonds to be discovered in biology. The hydrogenases and, by necessity, enzymes associated with cobalt utilization, involve metal-carbon bonds. Neither plants nor animals are independently capable of constructing vitamin B12. Only bacteria and archaea have the enzymes required for its biosynthesis. The complete laboratory synthesis of B12 was achieved by Robert Burns Woodward and Albert Eschenmoser in 1972, and remains one of the classic feats of organic synthesis, requiring the effort of no less than 91 post-doctoral fellows (mostly at Harvard) and 12 Ph.D. students (at ETH) from 19 different nations. Species from the following genera are known to synthesize B12: Acetobacterium, Aerobacter, Agrobacterium, Alcaligenes, Azotobacter, Bacillus, Clostridium, Corynebacterium, Flavobacterium, Lactobacillus, Micromonospora, Mycobacterium, Nocardia, Propionibacterium, Protaminobacter, Proteus, Pseudomonas, Rhizobium, Salmonella, Serratia, Streptomyces, Streptococcus and Xanthomonas. Industrial production of B12 is achieved through fermentation of selected microorganisms. Streptomyces griseus, a bacterium once thought to be a yeast, was the commercial source of vitamin B12 for many years. The species Pseudomonas denitrificans and Propionibacterium freudenreichii subsp. shermanii are more commonly used today. These are frequently grown under special conditions to enhance yield, and at least one company, Rhône-Poulenc of France, which has merged into Sanofi-Aventis, used genetically engineered versions of one or both of these species. Since a number of species of Propionibacterium produce no exotoxins or endotoxins and are generally recognized as safe (have been granted GRAS status) by the Food and Drug Administration of the United States, they are presently the FDA-preferred bacterial fermentation organisms for vitamin B12 production.